Bellis is a genus of annuals and perennials native to Great Britain, Europe, North Africa and the Mediterranean region. Gardeners prefer Bellis perennis, also known as English Daisy, Lawn Daisy and Bruisewort. The name Bellis perennis (pronounced BEL-liss per-EN-is) means "pretty perennial." It's aptly named. As one name suggests, Lawn Daisy can pop up anywhere. Indeed it can, even in North America where it was introduced many years ago. Though that might seem like a bad thing to aficionados of the perfect lawn, Lawn Daisy (Bellis perennis) inspires poets to wax eloquent. For many centuries, plants have come to symbolize various human emotions and characteristics. The study is called floriography or "the language of flowers." Snapdragon means deception. Ivy means fidelity. Violet means modesty. Rue means regret, and, incidentally, was known to be an abortifacient. Daisy means innocence. Bouquets could express feelings and messages without spoken words. Many have been worked into our expressions such as, "I rue the day...", "shrinking violet", "innocent as a daisy", "clinging vine." Using the language of flowers, Ophelia clearly expressed her thoughts. I won't summarize the plot. You can read Shakespeare's Hamlet yourself. English Daisy (Bellis perennis) is also known for its medicinal properties, as the name Bruisewort indicates. It has been used effectively to alleviate pain, hasten healing of cuts, bruises and surgical wounds, and to prevent bacterial infection. Bloom season ranges from late spring to mid fall. Flower colors include shades of crimson to pink, and white. Plant height varies from 6 inches to 12 inches. English Daisy (Bellis perennis) is at home pretty much everywhere in USDA climate zones 4 through 8. Slightly moist to well-drained loamy soil with pH ranging from 6.1 to 7.5 is recommended. Plant in full sun to partial shade. Take care not to over-water. Before planting, take a soil sample to your local Cooperative Extension Service office. For a small fee, they can run a lab test and tell you what your soil may need. Prepare the planting bed by cultivating at least 12 inches deep, removing all traces of weeds. Composted manure and peat moss may be incorporated into the soil. If you choose to use synthetic fertilizer, incorporate 10-10-10 fertilizer at a rate of no more 3 lbs. per 100 square feet into the top 8 inches of soil. Avoid synthetic fertilizers contacting any part of your plants. 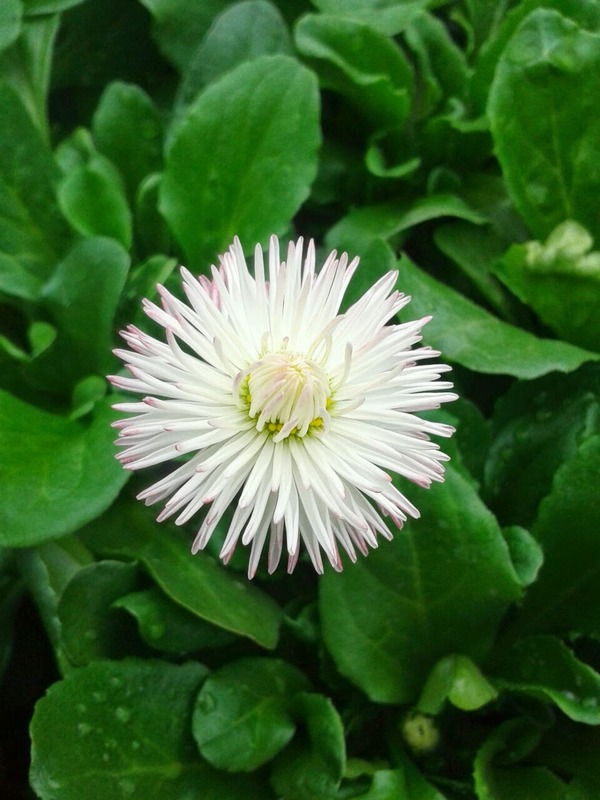 Space English Daisy (Bellis perennis) 6 inches to 9 inches apart. Dig planting holes into the cultivated soil a little less deep than the depth of the growing container. Water the plants in their pots. Place the plants into the holes and back-fill, watering as you go. Press soil around the roots. Do not cover the top of the root mass with soil. The tops should be slightly exposed. Water gently to avoid disturbance. Add a top-dressing of mulch around the plants, not on top of them, about 2 inches deep. The mulch helps retain soil moisture, so you can water less frequently. It also helps suppress weeds. English Daisy (Bellis perennis) is a charming perennial ideal for borders, container gardens, herb and medicinal plant collections, English gardens, poet and Shakespeare gardens. If you're a hopeless romantic, plant some in your lawn. Is "pot liquor" good for plants? A large oak tree has to go. What is eating my koi?